Some manufacturing plants can take advantage of relative price differences and cope with supply shortages by switching the fuels used in their furnaces, boilers, ovens, and other combustors. In the United States, the capability of the manufacturing sector to switch the fuels it uses has declined in recent decades, as described in a new report from EIA's 2014 Manufacturing Energy Consumption Survey (MECS). 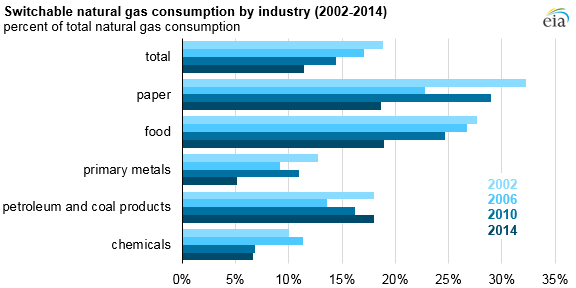 The shift away from using other fossil fuels in U.S. manufacturing, such as coal and petroleum products, was the result of increased availability of natural gas, lower natural gas prices relative to other fuels, and the ability of manufacturers to comply with environmental regulations when using natural gas. 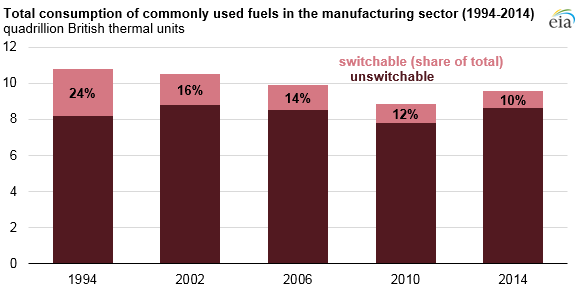 These factors led manufacturers to focus on natural gas use and to discount the value that fuel-switching capability had provided in earlier years. 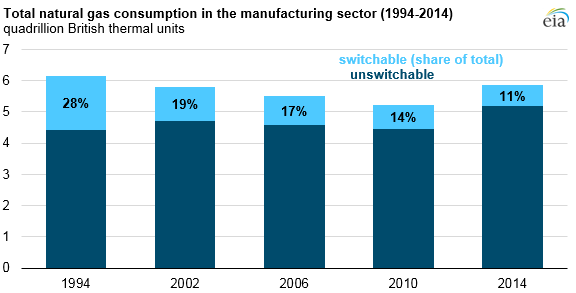 The share of manufacturing's natural gas consumption that was unswitchable increased steadily between 1994 (72%) and 2014 (89%).